Hayes Theatre Co presents, YOU'RE A GOOD MAN CHARLIE BROWN, based on the comic strip "PEANUTS" by Charles M. Schultz. Book, Music and Lyrics by Clark Gesner. Additional Dialogue by Michael Mayer. Additional Music and Lyrics by Andrew Lippa. At the Hayes Theatre, Darlinghurst, 5 - 30 July, 2016. 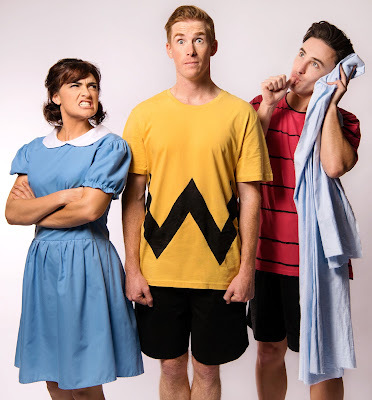 YOU'RE A GOOD MAN CHARLIE BROWN, is a musical based on the comic strip, "PEANUTS' by Charles M. Schultz. I first saw the first version of this show, in 1970 at the Playbox Theatre (Phillip St ), Sydney, produced by Harry M.Miller. Then, again, in an extended and revised version, on Broadway, at the Ambassadors Theatre in 1999 - with, memorably, Kristin Chenoweth, as Sally. The "PEANUTS" cartoon strip featured drawings of five-year-old kids: Charlie Brown, his sister Sally, 'crabby' Lucy, intellectual Schroeder, innocent Linus, with his blanket, and Snoopy, the dog, all spouting 'profound' observations of life, providing for its readers a kind of bluffer's guide to 'philosophy' for day-to-day survival in the gloom of the Atomic Age and Cold War era (later, as well, the last instalment was made in 2000). The comic panels of evidently young 'kids' partnered with 'balloons" of adult wit endeared and inspired generations of readers. The Musical has no plot but just a series of comic strip vignettes impersonated by actors interpolated with song. Almost verbatim quotes from the cartoon series, I am told. It is a nostalgic 'love-in' for the fans of the comic strip - self-evident, when one watched the reaction of some of the audience around me - and a wry intrigue for those of us less imbued with the knowledge or owned-affectionate, nostalgic cultural references. The show is, for those of us who are relative strangers to the core material, a lighthearted froth of humour and moderately interesting music from the composers, Clark Gesner and Andrew Lippa. Shaun Rennie has Directed - staged - this production with the ease of managing some very competent musical theatre performers: Ben Gerrard (Linus), Sheridan Harbridge (Lucy), Nat Jobe (Schroeder) Laura Murphy (Sally), Mike Whalley (Charlie Brown) and Andy Dexterity - he, making a late inclusion as a re-placement Snoopy. All of these actors give life to the comic caricatures with the knowing charm of adults playing witty precocious kids. I especially enjoyed the energy and brightness of Ms Murphy throughout, and she delivers: "My New Philosophy", as the best number of the night; the understated but accurate balance of Mr Jobe - his Beethoven 'Moonlight Sonata' song with Lucy, a gem of elegance; and the lisping ingenuousness of Mr Gerrard, as the saccharine blanket hugging scene stealer. For me, there is an edge slightly missing in Ms Harbridge's 'crabby' Lucy - her usual brio, inhibited by the boundaries of the characterisation, perhaps? Whilst Mr Whalley, as Charlie, does not have all of the 'heart' needed to endear us enough to the perennial loser, - it has, mostly, only a shiny gloss of permanent perplexity. Mr Dexterity gives us a brave performance, as Snoopy, considering the circumstances of it, but lacks the vibrant technical focus to fully claim it - it may, may, come as the season develops. Technically, the show is not as aesthetically successful as it could be to help substitute - distract us - from the thinness of the Book conception. The Set Design by Georgia Hopkins, has some 'crushed' grey-white hanging curtains as backdrop and wing drapes, that are 'visually' untidy, but, on the other hand, allows the lighting Designer, Hugh Hamilton, to throw a variety of bright colourings onto them to create a range of 'popsicle-rainbow' mood shifts (although, the lighting coverage of the actors in highlighted spotting, is often, irritatingly, gapped with shadow holes). Tim Hope, takes advantage of Ms Hopkins' curtains as well, and has created some fun AV Design to support the material of the Book and Lyrics. The properties design and execution (Snoopy's kennel etc) is well done. and managed by Mr Rennie with great efficiency. Choreographically, Mr Dexterity, has not asked enough of his actors, or stretched the possibility of that part of the musical too far - resulting in the dance being a little too obvious and repetitive - lively, but imaginatively, dull. The Musical Direction, by Michael Tyack, is first rate, with a four piece band, delivered to us through a sympathetic Sound Design by Jed Silver, and, together, they keep this Musical, at the Hayes Theatre, truly ebullient, afloat. YOU'RE A GOOD MAN CHARLIE BROWN, is well enough done for one to enjoy oneself, and that is especially true, if you're fan of the "PEANUTS" population created by Charles M. Schultz, which a lot of my audience seemed to be.